Last year around Bonfire Night celebrations, little man was only 7.5 months old so he wouldn’t have really understood what was going on, or noticed much. This year, being 19.5 months old, he is obviously more aware. He has had 2 Bonfire Night ‘celebrations’ this year! Last week we went to his Nanna’s and we had a feast of jacket potatoes, hot dogs and beans. And of course fireworks! (Well, we didn’t eat them, obviously…) We took the warm option and stayed inside looking through the kitchen window to watch them. With the lights out, he could see the shadows flying around the kitchen and he was loving following them around and pointing at them. He seemed to love the actual fireworks too when he saw them; he was giggling his head off, clapping, and saying ‘all gone’ when they had finished! Tonight on the official Bonfire Night, we went to the celebrations in the village where hubby grew up and little man’s Grandad still lives. Before we went out to watch the fireworks we had hot dogs again! 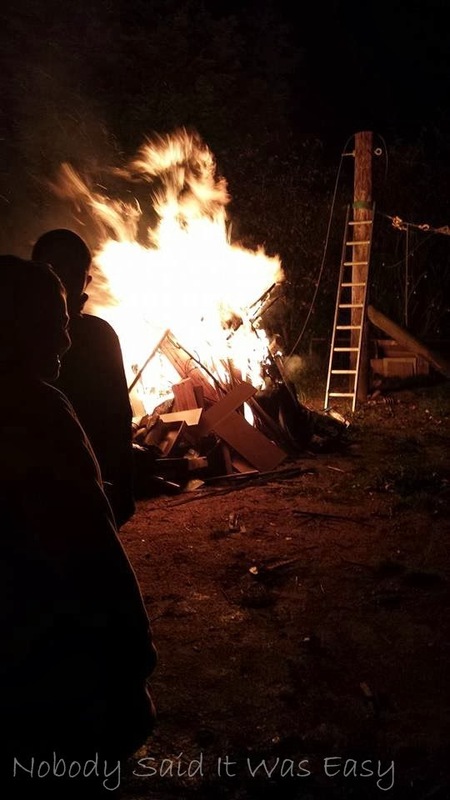 This time there was a bonfire too, placed in his Grandad’s neighbours huge garden. This is where everyone also congregated to watch the fireworks as it was pretty warm stood next to the bonfire, as you can imagine! There was also lots of soup and rolls to go round, perfect. 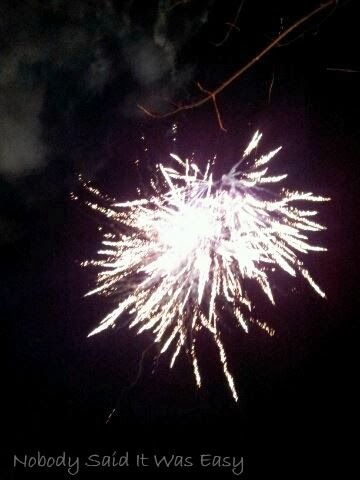 The fireworks were let off across the road on the riverbank so we had a good view. They started off small (though at one point the remains landed on the garage roof under which I was taking residence!) and saved the best ’til last – little man was okay up until this point, I think the loud bangs made him jump a bit! He was fine once he had a cuddle though. All in all we have enjoyed our first proper firework celebrations, and I can’t wait until next year when we have our new addition!